In this fast-paced, technological age, what someone “means” in an email, text, Facebook comment or message, has become easier to misunderstand. The tendency to make these wrong assumptions compared to the simple conversations of the past can cause broken relationships. Just when I thought I was good at multi-tasking, I realized, I’m an amateur in this department. I am so sorry I didn’t put a smiley face after my comment and it was interpreted as insensitive, insufficient, or worse. I’m sorry what I thought in my head, mixed in with all the other things on my plate, didn’t translate into an intelligible explanation. I really wasn’t trying to brush you off. I’m sorry I responded while in the line at the grocery store and couldn’t make my response as touchy-feely as you wanted. I’m sorry you think I’m upset with you or ignoring you because you had to wait for my response. We all have busy lives with responsibilities. I genuinely appreciate your patience in waiting for my response. I hope I haven’t appeared rude or insensitive. You deserve better than that. Please, just don’t read too much into what I meant when it doesn’t make sense to you. I’d rather speak with you to clarify things and avoid any further misunderstandings. What I wouldn’t do to go back to simpler times, when things were tech-free and conversation flowed easy. When we could hear each others tone of voice, see each others body language and have each others undivided attention. When we simply loved each other and didn’t allow an electronic device to decide how we expressed it to one another. Recently, I have had three such occasions where I was misunderstood using email, texts, and messenger. I have had instances in the past for similar reasons, but this time it affected my relationships negatively. One person actually assumed I was trying to avoid them and lied to them. The other read what I didn’t write and unfriended me before giving me the chance to explain what I meant. The third time the person thought they offended me. That made my heart sink. Every time I was misunderstood, I was taken back because the responses I got directly questioned my character and integrity. I thought, this just isn’t who I am. I felt bad that I wasn’t able to effectively communicate on technology to reconcile. I feel bad these people think I feel a certain way about them. Even more, I feel bad that they are not sure they trust me anymore. I’m not sure what I can do about that. People are entitled to their thoughts and opinions. My saving grace is knowing God understands what happened. It doesn’t take away the disappointment of losing friends for something that wasn’t true. I hope I can give people more grace in the future with this. Not be so quick to judge or shut someone out. I especially don’t want to leave any misunderstanding unresolved if I can help it. Relationships mean more than that to me. Let us all, PLEASE! 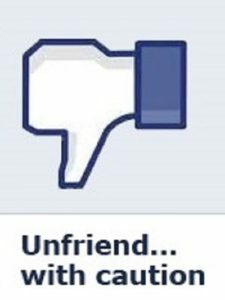 unfriend with caution.